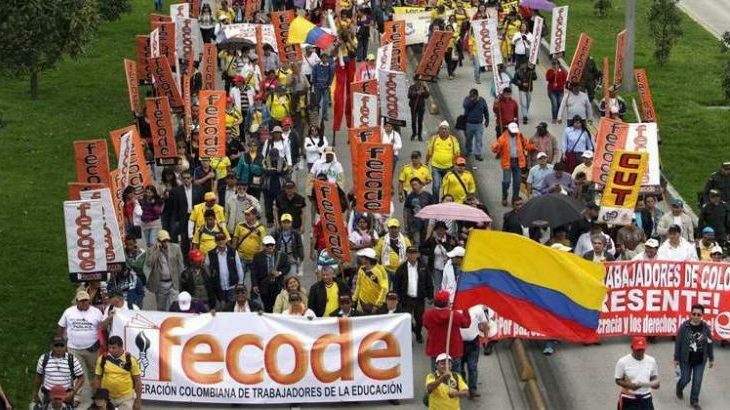 Colombia’s main teachers trade union, the Colombian Federation for Education Workers (FECODE), has staged a fresh 48-hour strike in a long-running dispute over underfunding, debt and conditions in the public education system. The strike, which took place across 19 and 20 March, is the latest in a series of major nationwide actions which include demonstrations in major cities and towns. In addition to demands for the fulfilment of agreements signed to resolve the massive 37-day education strike that shut schools and universities in 2017, teachers are calling for the full implementation of the 2016 peace agreement and better security for social leaders and human rights defenders, following the murders of hundreds of people since the signing of the agreement. Several teachers and trade unionists have been among the victims. In a statement, FECODE said that ‘today requires greater political will on the part of the National Government to find solutions within the time regulated in the negotiation process, because the delay will aggravate the already-critical problem of public education in the country’. FECODE members are also calling for improved health benefits, with the current system inadequate to meet needs. More strikes are likely if demands are not met.